So, when I first came back to the UK I needed something to get me out of the house when I wasn't working, and I decided to take up running. I'd attempted the NHS version of Couch to 5K before I went away but hadn't done very well at it, and then when I came back I started on the Zombies, Run! version which I was getting on quite well with... and then hit a wall. I just stopped enjoying it and was also feeling physically ill on runs, which didn't seem like a good thing. This also coincided with me starting work again and going straight from a temp job into my current role, so I ended up falling off the running wagon for several weeks. I have slowly started up again and am trying to go out at the weekends when the weather is nice, but my mojo has deserted me a bit. That's where Running Like A Girl came in - I'd heard it had good reviews so decided to give it a go. Alexandra Heminsley, or 'Hemmo', is one of those runners who is just like you - when she started out, after signing up to do a marathon, she could barely run round the block. But gradually, she improved, and has now run several marathons plus various half-marathons and 10Ks. The first two-thirds of the book is a memoir of her journey from complete beginner to serious runner, and is packed with the stories of the people who inspired her to run. I particularly identified with her relationship with her dad, who had run marathons back in the 70s and 80s - although my dad has never done anything like that, he has been running all his life and having that shared interest has been a lovely way to reconnect as well as having a source of useful running tips. So thanks Dad! The book then splits off into a shorter final third with Hemmo's tips on running equipment and also the stories of some of the pioneers of women's distance running, which I hadn't heard before - for example, that women weren't allowed to run the Boston Marathon until 1972 or the Olympic marathon until 1984, ostensibly for health reasons. There were some truly amazing women in there and reading their stories gave me a boost to keep going with my own running, especially with the awareness of their fight for women to be able to run professionally. 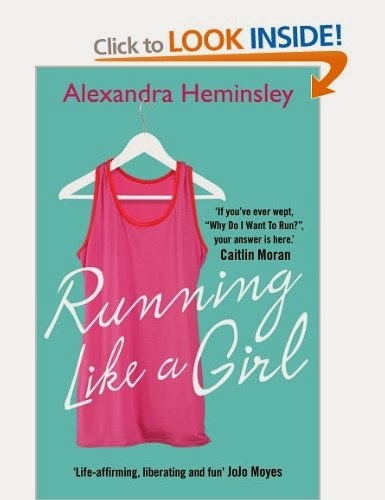 The message of the book is fairly simplistic - everyone can run, you just have to do it - but the fact that Hemmo tells her story with such wonderful humour and is brutally honest about the struggles she experienced even in just starting to run, as well as how her motivation for running evolved. Overall this was a great book: light, easy to read (I finished it in a couple of days), warm and relevant. If you want to get into running but don't feel that you can, then I highly recommend this book; it will make you believe that, to paraphrase Barack Obama, yes you can. If you fancy reading Running Like A Girl, the Kindle edition is £8.54 on Amazon, or you can get the airport-sized paperback for £9.09 (the normal-sized paperback comes out in January, no doubt to capitalise on people who take up running as a New Year's Resolution). Have you read Running Like A Girl or any other running books? What did you think of it? And what kind of sports or exercise do you like to do? Let me know in the comments and have a great day!